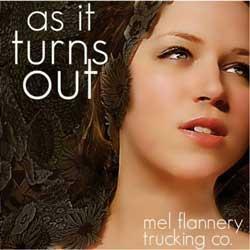 By Mel Flannery Trucking Co.
Melanie Flannery fronts a New York-based jazz ensemble called the Mel Flannery Trucking Co. Backed by bassist Matt Aronoff, drummer Danny Sher, and keyboardist and songwriting collaborator Lee Pardini, Flannery cultivated a sound that bridges pop, cabaret, jazz, and soul. Their latest offering, As It Turns Out, remains consistent with previous releases. It also has little to recommend itself. While not unpleasant, the album did not capture my imagination. The arrangements are nice, if a bit too staid and preoccupied with conveying boho sophistication. Flannery and Pardini's lyrics tend to reflect on failed romance without tapping into new insights from such a well-documented subject in popular songwriting. Likewise, Flannery's alto is nice, but lacks singularity in tone or phrasing to set her apart from other jazz-inflected musicians who might grace Starbucks compilations. Regrettably, I heard little variance between songs in As It Turns Out. I had difficulty telling the difference between "Something About You," "Lift Me Up, Tie Me Down," "We're Still Here," and "I Won't Say Goodbye." I do like Pardini and Sher's flourishes on "I Need You Here With Me," and "You Know What To Do." The latter also serves as one of the album's most appealing track, with Flannery cutting loose. I also appreciate the goofy lyrics in bonus track "You Are the Only One For Me." Flannery's biggest moment is "Gone," the album's proper closer, which boasts a lovely vocal performance brimming with emotion. At times, the group's clean, slightly funky sound provides a jarring contrast with a song's content. This is most evident in "Running," a groovy slow jam about domestic violence. I appreciate Flannery and Pardini's efforts to represent a very real social problem from a survivor's perspective. This extends toward the album's liner notes, which provide information on the Human Rights Campaign and the National Domestic Violence Hotline. I don't think the song needs a foreboding sound to reflect the content. I just feel strange about the song having such a swing to it. The group's talent is evident. I just wish I had more of a personal stake in the results.